This is our home, our sanctuary. IMG Academy is located in Bradenton, Florida. Professional-quality facilities and immaculately maintained fields and surfaces are the standard on our campus. Accommodations for student-athletes are modern and offer the ultimate training environment while maintaining the sense of home that boarding school students desire. Campus is the heartbeat of IMG Academy providing easy and secure access to everything from housing and dining to nutritional coaching and laundry services. There is always something to do outside of academic study or athletic training. Student-athletes often make lifelong and lasting relationships with peers while attending IMG Academy. Ascender Hall East, West and South are multi-story residence halls that provide students with a furnished dorm-style room that includes bunk beds, desks, wardrobes, bathroom and full room cleaning service once per week. The halls also include recreational rooms to socialize and play video games with common areas to meet students or staff. Other amenities include: a snack shop, mail room, study rooms and laundry rooms. Additional laundry, dining and maid services are available to customize each student-athlete's stay. Campus Life staff manages our residence halls and assigns residential mentors to oversee and manage daily activities and events. We assign two residential mentors per floor to promote a safe atmosphere. 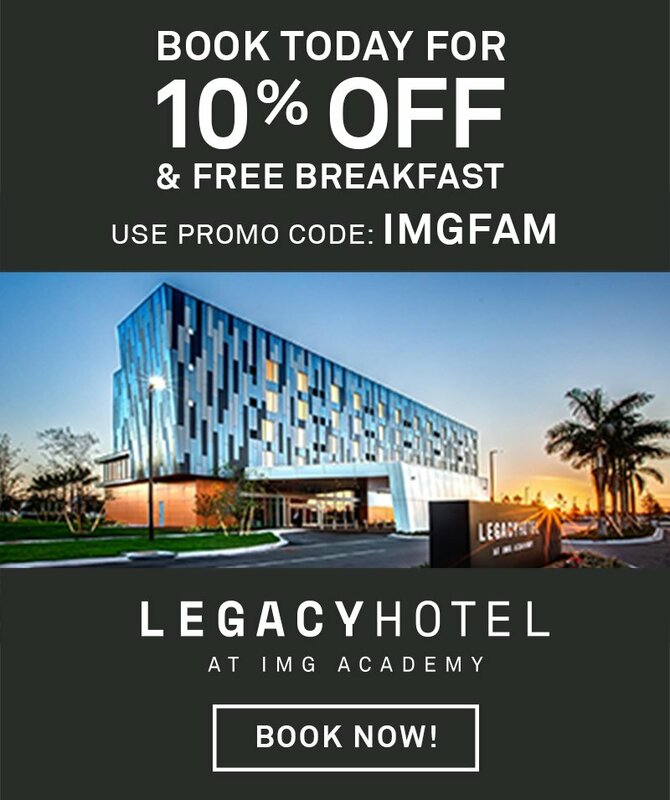 Make your IMG Academy experience truly unique, explore different residence hall floor plans to gain additional privacy or select a larger floor plan when staying with friends or family. Family, friends, and visitors have many options to choose from while visiting IMG Academy. We even have real estate sales and rentals available for longterm residents who decide to live near their students while they attend the academy. Whether by foot or by tram service, getting across campus is a breeze. Tram service runs everyday of the week for easy access to the campus center, dorms, training fields and more. Head over to our virtual campus maps to see all 500 acres of our beautiful campus, or schedule a visit with an advisor for an in-person campus tour. Student-athletes at IMG Academy have the same opportunities as any other teenager. Engaging in events such as homecoming and prom are the highlight of year for many students. Taking advantage of both on and off-campus activities helps build relationships and reinforces the sense of community. On-campus offerings include: flag football, dodgeball tournaments, talent shows, movie nights, ice cream socials and holiday celebrations. Trips and excursions include: Local Beaches, NFL Tampa Bay Buccaneers games, Disney World and Universal Studios theme parks, NBA Orlando Magic games, Bowling, Busch Gardens, Kayaking/Canoeing, MLB Tampa Bay Rays games, Airheads Trampoline Park, and weekly trips to local shopping centers and malls. In addition to on and off campus activities, students are also welcome to form and join clubs with fellow students. Buffet style dining offers nutritionally-planned breakfast, lunch, and dinner options that rotate daily. Plus, boutique cafes are open for easy food and drink options, including coffee, pastries and sandwiches, stir frys, burritos and sushi, and now featuring a brick oven pizza cafe that offers unique italian style dishes. The Clubhouse Dining Room selections give adult guests and athletes the chance to maximize the benefits of the work put in at IMG in a quiet environment. Our nutrition division can help athletes develop strategies to set a foundation to help fuel an athletic lifestyle. Student-athletes have 24/7 access to the IMG Academy Health Services Center, which provides the care of Johns Hopkins All Children’s Hospital (JHACH) right from the Bradenton campus. All IMG Academy on-staff nurses are affiliated with JHACH and are available to provide compassionate care for our student-athletes along with medical attention for any health concern that may arise. Health Services can also distribute prescription medication, schedule on-campus appointments, or we can provide transportation to off-campus medical appointments, if needed. Safety and security of student-athletes is the single most important aspect of campus. The Campus Safety team staffs security checkpoints at every campus entrance and exit, and it operates safety patrols throughout the campus. In addition to providing you access into academic, athletic facilities, and residence halls across campus, this safe, real-time feature will allow cardholders the ability to manage transactions, deposit additional funds, and make purchases on campus. Do more at IMG Academy, explore the IMG Academy Golf Course, indulge and relax at the Wellness Spa or find exclusive IMG Academy apparel in the Campus Center bookstore or online through Shop IMG. IMG Academy enjoys close proximity to some of Florida's best beaches & attractions. Find the nearest airport, explore local attractions, or learn more about relocation services. Let us assist you in scheduling airport pickup & drop off or take advantage of the IMG Academy discount with Enterprise Rent-A-Car.